One of the more unfortunate shutters in recent times has been that of The Royce, the flagship restaurant at Pasadena's Langham hotel. Ever since opening at the end of 2010, the place had been one of my favorite spots in the Southland thanks to Chef David Feau's elegant, sophisticated cooking. However, I suppose the cuisine never really resonated with the area's demographic, and the restaurant ended up closing on January 26th, much to my disappointment. 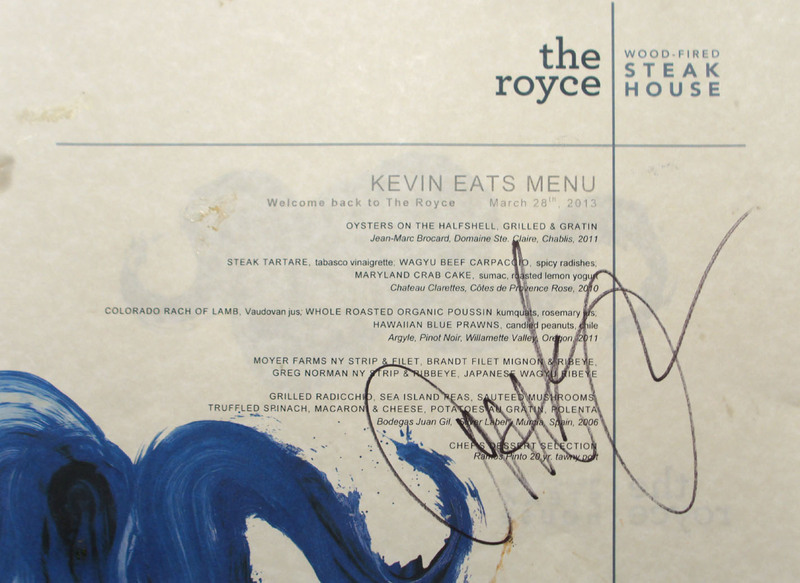 In its place comes a new incarnation of The Royce, this time a steakhouse that's ostensibly much better suited to the hotel's target clientele. 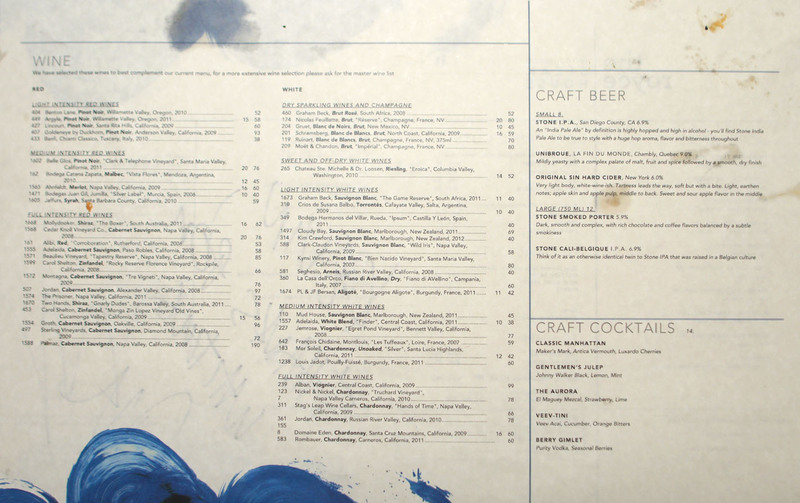 This new concept debuted on March 15th, and is helmed by none other than Chef Anthony Zappola of Craft fame. About the Chef: Raised in Cleveland, Ohio, Chef Zappola got his start in the industry at age 15, working at an Italian restaurant in his hometown where he worked his way up from a dishwasher position. From there, he cooked at a number of local eateries before deciding to go to culinary school. 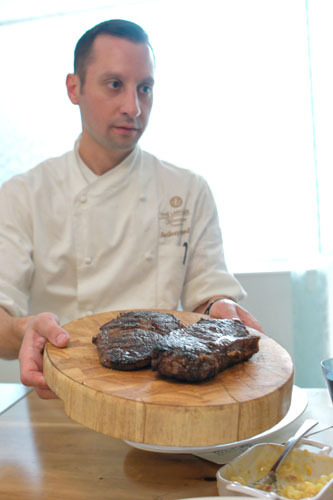 Zappola attended classes at the Scuola di Arte Culinaria Cordon Bleu in Florence, Italy for nine months, then began a year-long program at Le Cordon Bleu London in 2000. After graduating in 2001, he moved back to the States and found employment in Chicago, and then New York. 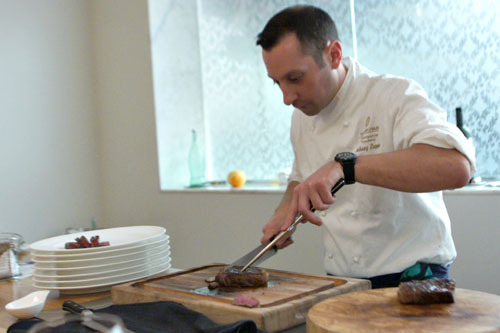 In July 2004, he started at Tom Colicchio's Craft, making his way up to the post of Sous Chef in charge of private dining. Zappola then moved to Texas in the middle of 2006, where he opened Craft Dallas as Executive Sous Chef. 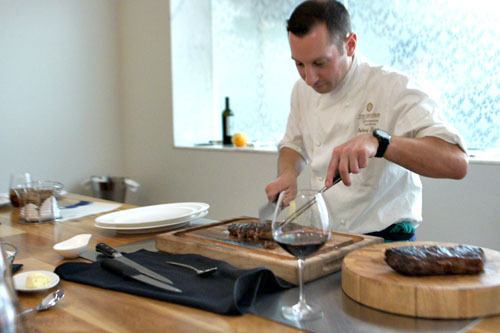 A couple years later, he was promoted to Chef de Cuisine after the departure of Kevin Maxey, but would leave in May 2009 to take the reins at Craft Los Angeles, replacing Matt Accarrino (now at SPQR in SF). Zappola's Pastry Chef, Shannon Swindell, would also leave Dallas for LA, taking over for Catherine Schimenti. 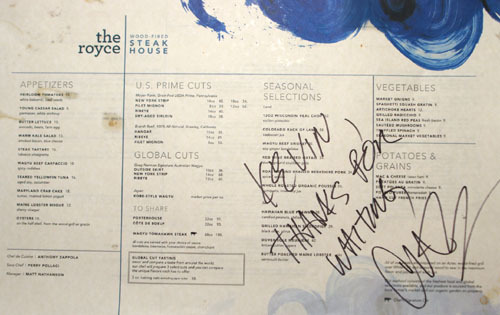 His tenure at Craft lasted until the end of 2010, and the Chef spent a couple years under the radar (which included an unpublicized stint at Animal) until re-emerging earlier this year at The Royce, where he's joined by David Feau's old Sous Chef Perry Pollaci as well as new General Manager Matt Nathanson. 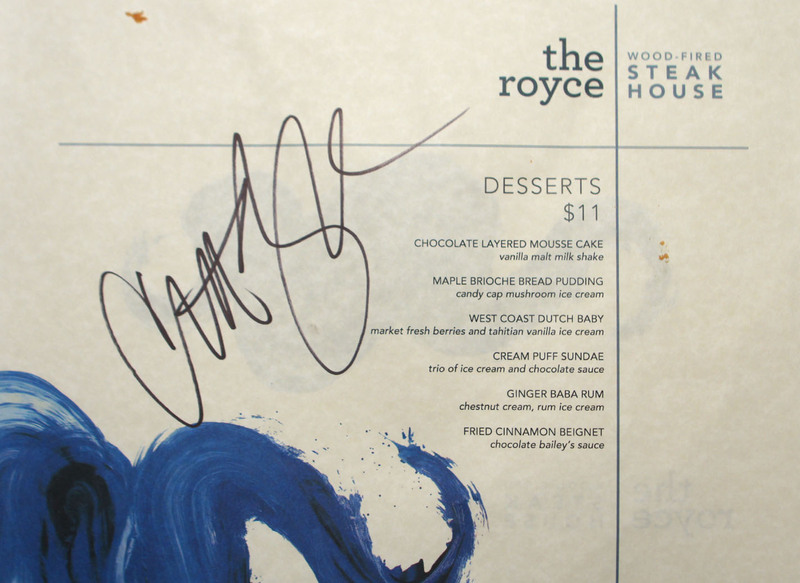 The Royce's new steakhouse menu is fairly par for the course given the genre, and focuses on high-end cuts cooked on an Aztec wood-fired grill that burns white oak and other sundry timber. À la carte is the way to go here, though it is possible to arrange a special tasting at the Chef's Table (normally used for communal seating) as we did. Click for larger versions. 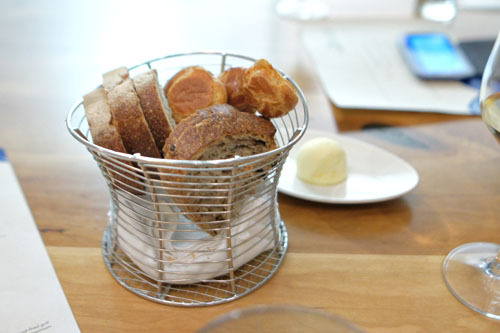 The bread selection consisted of gougère, olive, and whole wheat sourdough varieties, paired with a nice butter. Oysters come in three varieties here, and we had to try all of 'em, natch. 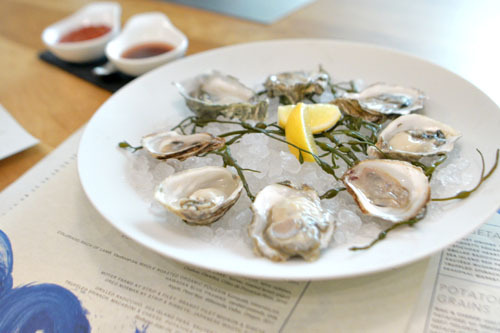 In raw form, we had Kusshis, one of my favorites, and they were prototypical of the style: clean, crisp, and oh-so briny. 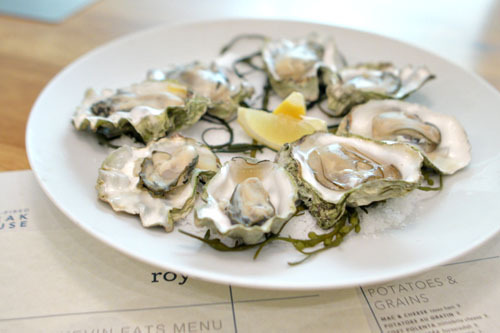 Crystal Bay oysters arrived lightly grilled, with the smoky, charred flavors from the cooking process forming a fitting balance to the oysters' inherent salinity. 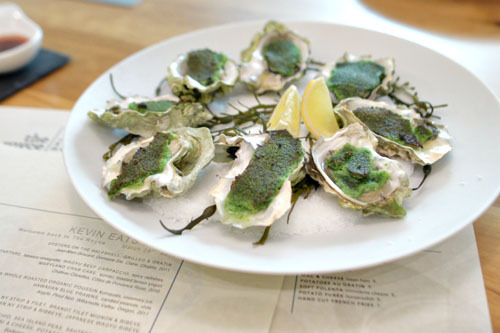 Finally, we had Misty Bay oysters, a hot, heartier presentation that married the natural flavors of the bivalves with a hit of rich, savory, vegetal nuances from the dish's au gratin topping. 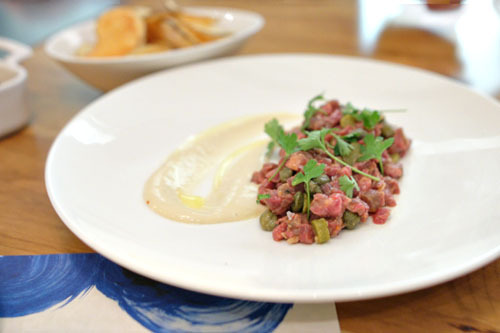 The quintessential steak tartar was done proud here. The meat itself was spot on in terms of texture, and melded beautifully with the pickle-y bits incorporated within. 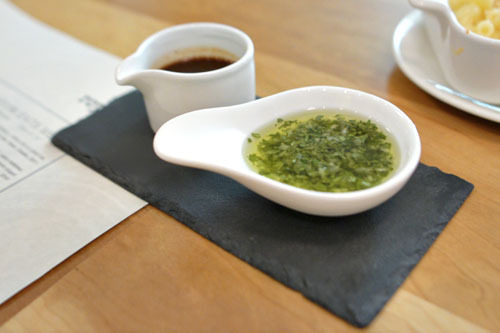 Even better, though, was the use of Tabasco, which added a jolt of heat that lingered long into the finish. The included potato chips were a nice touch, too. 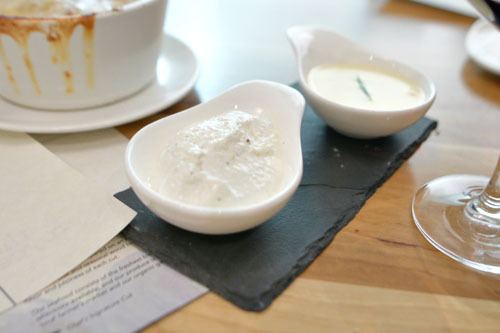 A must-try as far as the appetizers go. 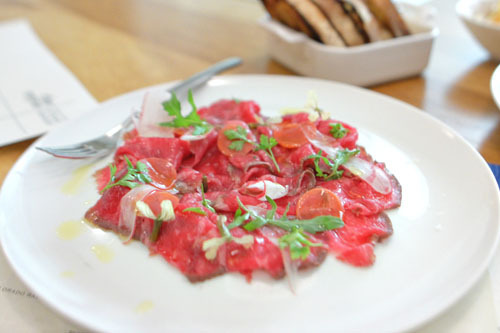 A carpaccio was made from beef cured in-house for three days, and was surely one of the best preparations of the dish I've had, putting forth a definite gravity and meatiness that I found quite satisfying. The kick of the olive oil made sense here too, tying together some of the flavors, while the greenery on the plate provided some bright, bitter counterpoints to the heft of the beef. Loved the accompanying bread here as well, which came toasted on the wood grill. 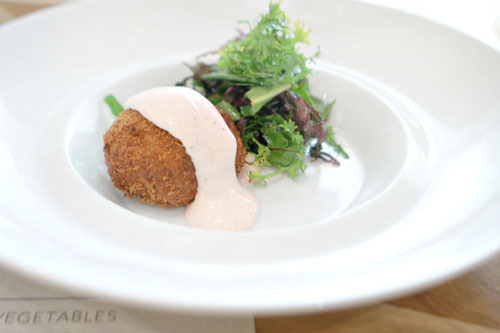 I've still yet to find a crab cake that surpasses the one at Gulfstream, a damn shame given that Gulfstream is such a corporate-y type of chain restaurant. The version here tonight was good, but again, still didn't reach the lofty level I was hoping for. 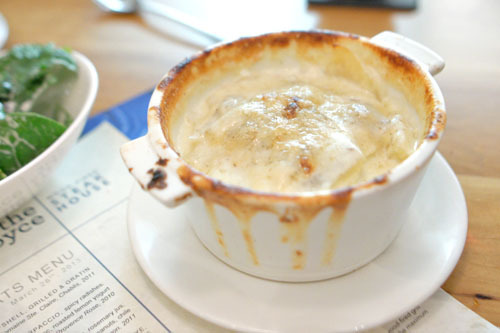 The sweet, saline essence of crab was there, though unfortunately its impact was lessened by the fried outer batter. That being said, the dish still worked, with the yogurt and sumac providing a tart, tangy balance to the fritter. 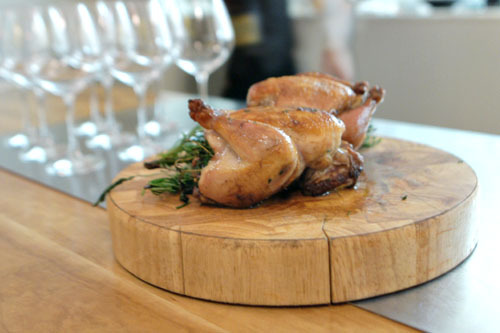 A pair of poussins were brought out tableside before being taken back to the kitchen to be carved and plated. 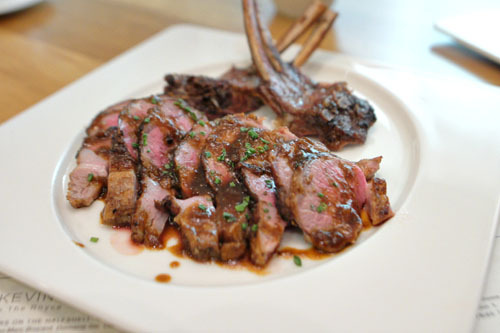 A rack of lamb arrived deftly prepared: tender and definitely "lamb-y," with a good hint of char goodness and a mélange of sweet and spicy notes from the vadouvan. 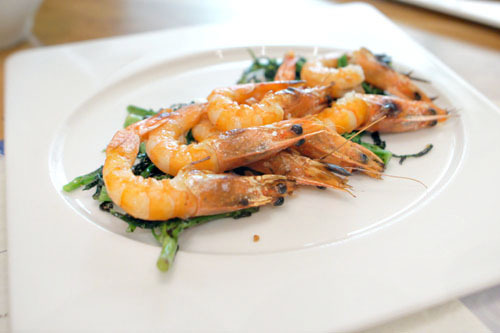 Taste-wise, the prawns were on point, showing off an appealing salinity to them. However, texturally, I wanted them snappier, springier, with more of a bite. The greens did work here gorgeously though, imparting a fantastic bitterness and whisper of char to the dish. At this point, the aforementioned poussin arrived at our table. Though it was basically a small chicken, it was quite unlike your typical preparation of the bird. 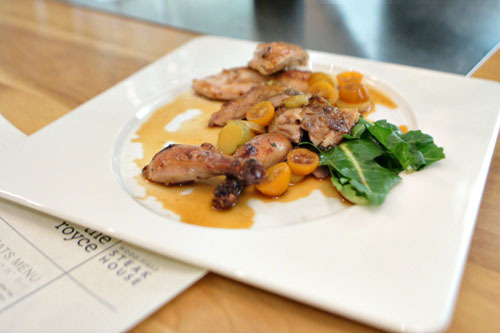 The poussin conveyed a pretty remarkable depth of flavor to it, along with flesh that was firm, taut, and dense to the bite. Along with these more substantial courses came a few of our sides, my favorite of which were the peas. 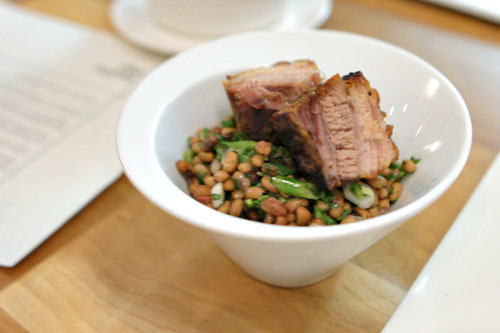 I loved their firm, substantial texture and rich, robust flavors, tempered by the bright, herb-y, spicy nuances in the dish, all while the pork belly added a delectable hit of salt into the mix. If you're only going to get one side, make it this. Polenta, meanwhile, was pretty much flawless: creamy, cheesy, subtly gritty, and undeniably satisfying. 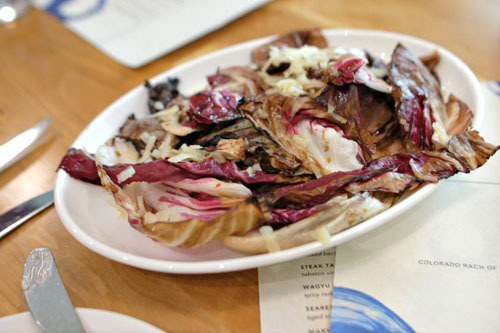 Radicchio displayed a delectable balance of bitter and smoky flavors, though I would've liked the leaves a touch crisper. 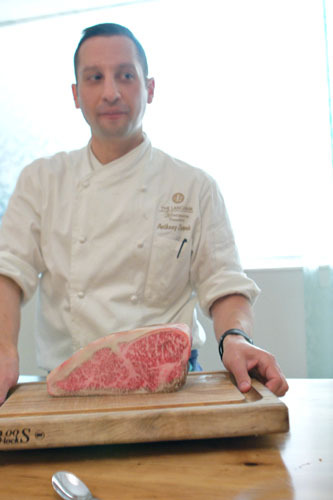 Chef Zappola brought out a slab of his well-marbled Japanese stripsteak prior to grilling, then came back to slice the meat tableside. 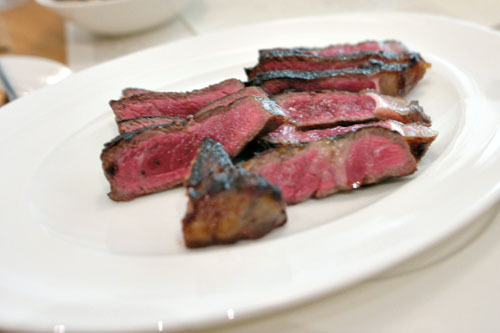 What we had here was a strip loin of kuroge beef from Gunma Prefecture, priced at a not-unreasonable $25 per ounce. 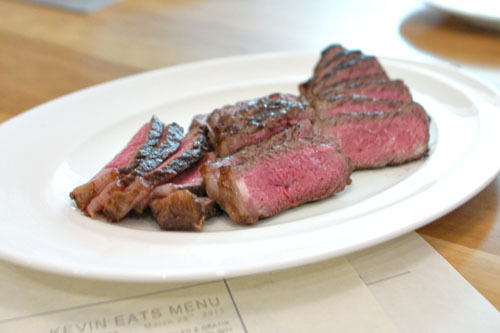 It was exactly what you'd expect from real-deal wagyu: lush and melt-y, with an apparent, but well-integrated fattiness to it that was beautifully moderated by the slight char astringency in the steak. It's a cut above everything else that's out there, and definitely worth your time and money to try a few ounces if you've never had genuine Japanese beef before. With the Japanese beef dispensed with, we were provided a quartet of sauces, which are complementary here: Bordelaise, chimichurri, horseradish cream, and béarnaise. They weren't truly necessary, but did provide an additional dimension to the steaks. First up was a quintessential cut of standard New York strip, done rare (note that we did not request specific temperatures, instead relying of the Chef to make the proper decision in each case). Good flavor on this one, with a noticeable amount of fat as well. Compared to the strip, the filet was of course a step down in terms of flavor, though it was utterly tender, with a char complement from the crust. Could've been a touch rarer, though. 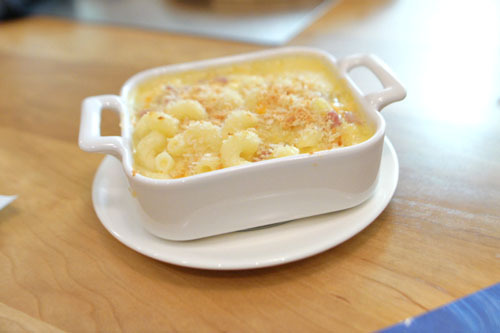 Zappola's mac 'n' cheese was something special, incorporating not only a trio of cheeses but a maple Béchamel sauce, which resulted in a fantastic sugary undercurrent in the dish. I appreciated the additional complexity of the tasso here as well. Spinach was quite to my liking. I really appreciated how the texture of the greens was so deftly displayed here, and how the bitterness of the veggie was so aptly complemented by the earthy dressing, redolent of truffle. 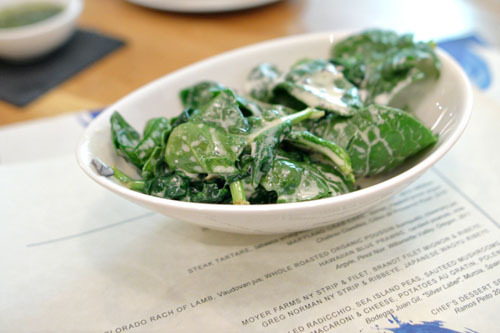 A must-try for the spinach fiends out there. 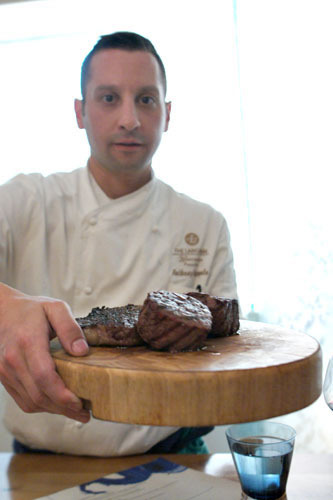 Here, Zappola shows off some tasty looking cuts of Brandt beef. Moving on, we had here filet mignon from local producer Brandt Beef, which was a remarkable step up in terms of flavor. It conveyed an almost "earthy" flair to it, which is hard to find with filets. For me, this was definitely worth the uptick in price vis-à-vis the Moyer. The Brandt rib eye would probably be my choice among all the steaks here if I had to consume a bunch of it. It displayed a bold, focused beefiness to it that was joined by a well-placed fatty character, resulting in an supremely balanced steak overall. Mushrooms, meanwhile, were just what I was expecting. Can't go wrong with this. 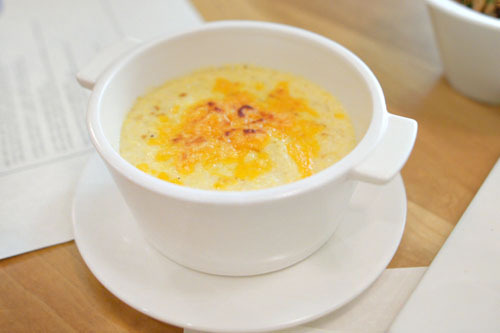 The potatoes gratiné was a fairly classic interpretation of the dish, with the firm, hearty cuts of potato augmented by a rich, enveloping cheesiness, all while a touch of pepper offered up a nice counterpoint. 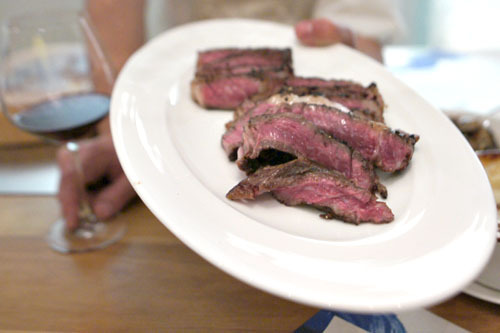 Last up was Australian wagyu from producer Greg Norman. This was another commendable presentation of rib eye. Compared to the Brandt, this was a more luxurious cut, with a more in-your-face richness and more apparent fattiness. I'd have a tough time choosing between the two. 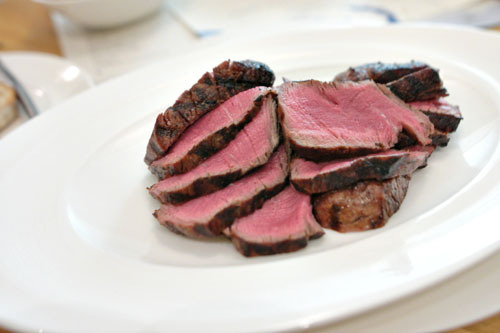 Lastly, we ended with the Aussie striploin. Again, there was strong flavor, appropriate char on this preparation, nothing out of place, but I'm not sure if it's worth it over the non-wagyu beef, which was already very good. Desserts are now the task of Pastry Chef April Baton, who actually started out working here under David Féau. Click for a larger version. 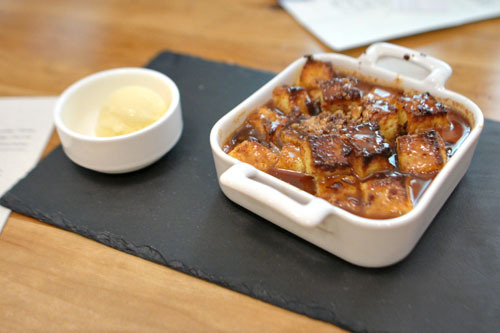 We began with a lovely bread pudding, the bread really soaking up all of the goodness that the maple had to offer, while the candy cap added an additional hit of sugariness to the fray. 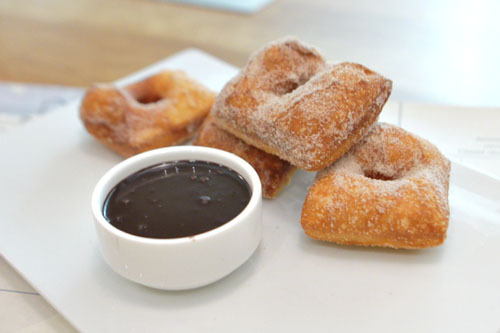 Beignets were straightforward in presentation, offering a churro-esque sweet spice to them that made sense against the chocolate-y Bailey's dip. 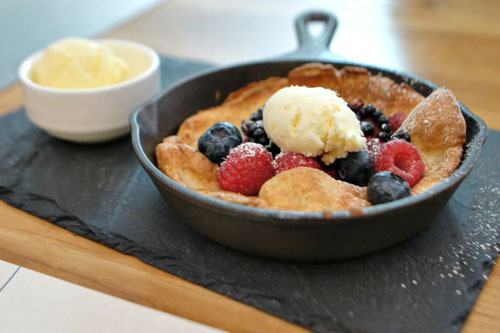 Next was a version of the Dutch baby, a light, almost fluffy and soufflé-like pancake. Its pairing with tart, tangy berries and ice cream wasn't groundbreaking, but was effective. 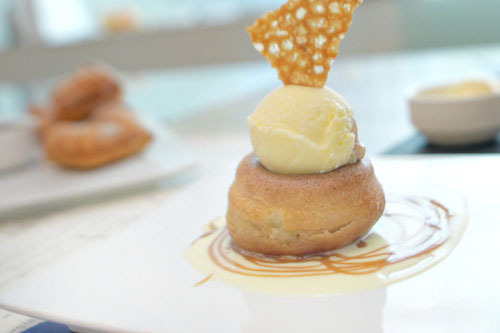 Here was the Chef's take on the classic baba au rhum. It maintained the traditional appeal of the dessert, conveying an interplay of sweet and boozy flavors, all while the use of chestnut cream and salted caramel added further facets to the dish. The rum ice cream, meanwhile, was the perfect topping to the cake, and I appreciated the texture from the cinnamon tuile as well. We concluded with my favorite dessert of the evening. 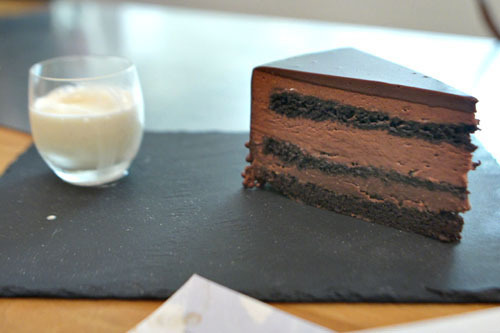 It was pretty much your perfect chocolate cake, an unabashedly sugary, uncompromisingly satisfying smack of cacao-laced goodness, wonderfully paired with that delightful vanilla shake. Over the past several years, CUT in Beverly Hills has consistently been my favorite steakhouse in the Southland. However, my last experience there was somewhat disappointing, and thus this new incarnation of The Royce has a good shot at taking over that top spot. The food, from the steaks to the sides to the apps, was consistently strong overall, and Zappola really is a great fit for the job. The use of a wood-fired grill, meanwhile, adds a wonderful char character and complexity to the cooking that helps set the place apart. 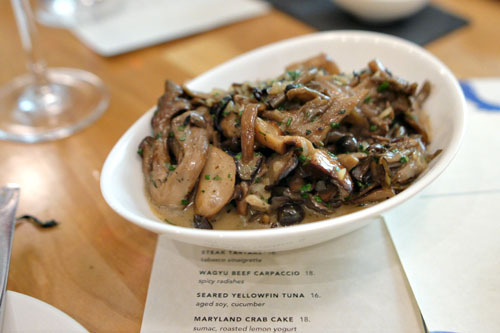 To take things over the top, what I'd love to see is the restaurant increase the scope of its own dry aging program. 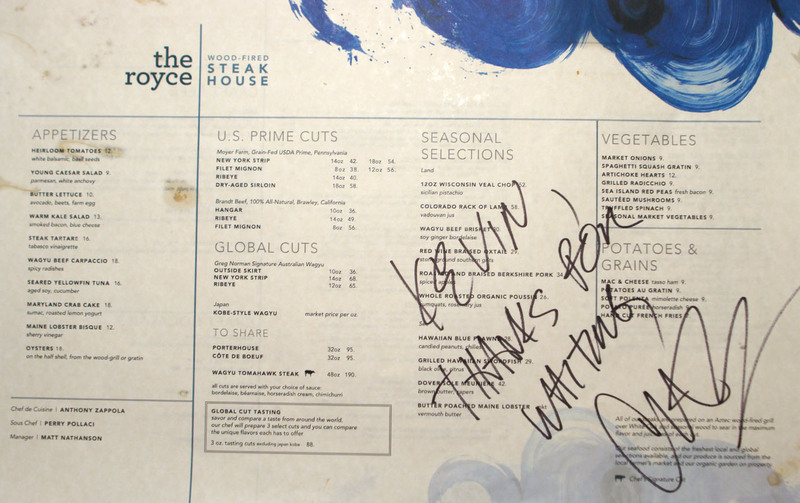 Either way, what we have here is undoubtedly another great addition to the Los Angeles steakhouse scene. Good review, I was wondering when the steakhouse was going to open. A couple things: Greg Norman the golfer is now Greg Norman the entrepreneur. I'm not sure I can make perfect sense of all the Kobe-variations out there nowadays and how that converts to price and taste. So, it sounds like this is kobe-style because it is not from Hyōgo Prefecture. 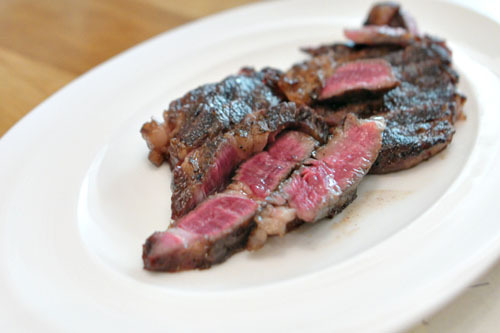 But it's still from 100% Japanese Wagyu cattle and pretty good stuff. I'm still full from dinner. 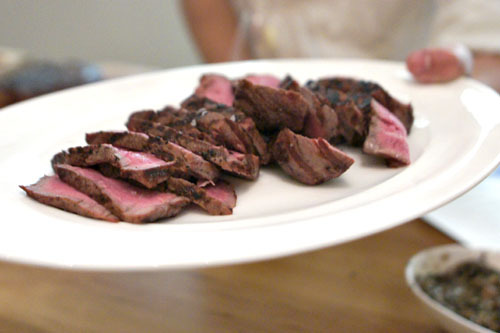 Vinh: We wanted to try a lot of different types of steak, hence the pass on that three-pounder. Next time though. 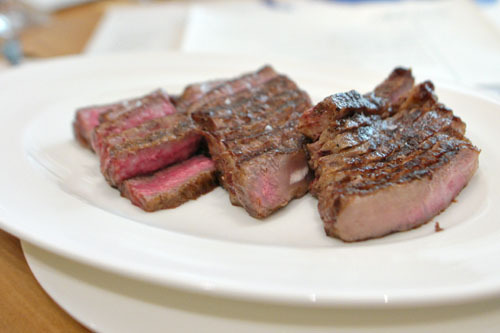 Waleed: The only time I've had "true" Kobe beef from Hyogo Prefecture was recently at IO by Playground. In my experience, as long as it's Japanese wagyu (which refers to multiple breeds), you're pretty much ok. American or Aussie "Kobe-style" doesn't compare. Charlie: Yeah I was definitely still feeling the effects of the meat/booze the next morning. It was not a pleasant feeling. Jen and I are going to Japan in a couple weeks, I'll let you know if there some good beef places we encounter. And FYI if you go again, it was the hardest place for reservations, 4 restaurants said no and we tried to book 2 months out.